It can be challenging out there for craft breweries – we spoke to two about how they make it work. INTRODUCING A QUOTA for craft beer taps in pubs could help bolster Ireland’s craft beer industry, according to one brewery that’s seen the challenges facing Irish brewers. “We’ve seen craft breweries close down – at least four gone this year,” Paul Mullin, managing director of the four-year-old Sligo-based brewery The White Hag, told TheJournal.ie this week. Mullin made the comments as he prepared for the Hagstravaganza event, to which The White Hag has invited breweries from across the world to visit Ballymote to show off their wares. Macro (mainstream) breweries like Diageo, C&C and Heineken hold such prominent positions in bars that it makes it tougher for pubs to choose to feature micro craft breweries, and having the macros then create their own ‘craft’-style beers can make it even harder. Mullin said such macros have “been able to use innovating distribution methods and marketing to… essentially grab the market and get a monopoly, especially in the last 50/60 years”. “Some would say the craft market is flooded, but that’s purely down to the distribution of the bigger breweries, your macros,” said Mullin. “It’s making it easy for a publican to say ‘I have craft beer – it’s Hop House [owned by Guinness] or Cute Hoor [a Heineken beer]‘ for example. That’s very challenging for us, to get tap space,” said Mullin. That elusive and all important tap space – which means beer is served on draft – is what craft breweries want, said Mullin. The business can often have long lags between payments. You get more volume and make more money from taps, compared to packaged beer, which makes things easier for small companies. But this has been incredibly challenging for craft breweries – how do they promote their beer, and how do they access taps? What The White Hag wants to see is “anti-competitive practices” stamped out. Some craft drinks producers have already told Fora.ie about cash sweeteners that some big companies offer pubs, which they fear lock them out. It would also like to see a quota put in place, similar to one regarding Irish music played on radio, where a certain percentage of taps in a pub have to be Irish craft beer. Many radio stations have a quota of 30% Irish music, but there was a call in 2016 for a 40% quota. “You could apply the same thing in Irish pubs – give over a certain percentage of your taps to Irish breweries. The whole beer industry could benefit from it and certainly Guinness isn’t solely living off what it makes in Irish pubs, but it’s very valuable to it,” said Mullin. He said that the craft beer industry employs the equivalent of seven times more people than macro breweries. It’s also creating jobs in rural areas – these aren’t all Dublin based. The county with the most craft breweries is Cork. Every county is getting a spread from this. The idea of a local craft brewery isn’t a new one. “If you go back 200 years ago, you had several breweries in every major town and county,” said Mullin. A 2017 report by Bord Bia found that the number of craft breweries has grown by a huge 500% between 2012 and 2017, going from 15 to 72. Together, they employed 500 people. Naturally, you’d hope that this went hand-in-hand with a rise in consumption of craft beer. According to the report, the craft beer consumption market share went from 0.6% in 2012 to 3.0% last year. Why do people choose craft beers? Is it just a status symbol, or do people really care that much about the beer they sup? “The taste that Irish people are developing for local produce – we’ve seen it with food. We’ve come a long way in Ireland, we’re looking for provenance and indigenous Irish food,” he said, mentioning the likes of the late Myrtle Allen as responsible for stoking this appetite for homegrown grub in particular. The same thing is happening with beer, it’s down to discerning consumers. Craft beer shops and pubs who are insisting on stocking good Irish beers and who are insistent on stocking beer they can trace the provenance of – the brewers and businesses. With that they are able to transfer knowledge of the brewery onto the consumer, and are able to talk to them about the beer. This personal touch isn’t something you can necessarily get with the bigger beers, and it “creates a bit of a revolution within the beer market industry”, said Mullin. This is also reflected in the experience of one of the world’s top craft brewing companies, Cloudwater. Paul Jones is the founder of Cloudwater, which is a Manchester-based craft beer company that offers seasonal, rotating beer styles. In setting up the company, he was inspired by experiences he had around coffee and food, where he put his trust in local restaurants and cafés to be tastemakers for him. He was happy to rock up to an eatery that offers its own unique blackboard menu every evening. “It made sense to apply those same philosophies in beer,” he said. What about people who find the world of craft beers confusing, or just not for them? Jones said he understands this. “If there’s any discomfort, where’s that really coming from? At the base of it people come to a glass of beer or a bar because they want to relax,” he said. He said that craft breweries have to help people feel comfortable with and excited about beer. We’ve always got to pay attention to not getting carried away with ourselves to the point where there is any element of snobbery or elitism in the way we talk about our beers. What The White Hag and some other Irish craft breweries want is a taproom, where customers can visit, try products and buy directly. Mullin explained that this means selling directly to the public, so there’s no middle man, and the cash goes straight to the brewery. It also offers a lower-risk way to try out new beer styles. “We have lots of friends across the industry in the UK and USA who are thriving off the taprooms,” said Mullin. Although The White Hag gets between five and 10 requests a week from tourists looking to visit its brewery, it’s currently illegal to sell them beer without taproom legislation. That’s set to change when legislation drafted by Labour’s Alan Kelly is introduced – it will allow breweries to offer beer for sale after visitors have completed a tour, between defined hours. “If we can turn that into a tourism industry, there is another spoke in the wheel of creating a self-sustaining industry,” said Mullin. The hope is that it will help craft breweries to bring in cash and enable them to reach their customers in a better way. 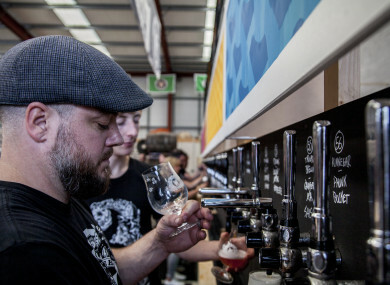 Independent Craft Brewers of Ireland – which represents microbreweries here – anticipates the first taprooms and sales from breweries will kick off in 2019. Attendees at last year's Hagstravanganza. The impact of Brexit is something that is worrying UK-based brewers like Cloudwater. And it turns out the taproom is helping some of them deal with the impact so far. Could some British brewers move to Ireland as a result of Brexit? Jones agreed that it is feasible to imagine that at least some breweries could wind up producing in Europe – but others might just concentrate on the domestic British market. But Jones isn’t just thinking about the financial impact of Brexit. He’s concerned about its impact on his customers, and hopes that in its own way, beer can bring people together. “The interesting thing about craft beer is we have consumers that are in so many different industries that affect so many parts of society,” said Jones. If we can succeed in making craft beer a truly wonderful and open and positive movement, [then] craft beer bars aren’t just somewhere you can get drunk like the place down the road. They can feel very welcome irrespective of who you are or how you feel. It could be a model to the wider drinks industry. Neither Mullin nor Jones believes that bars should be solely about craft – but they want their respective home countries to have a flourishing craft beer industry too. The White Hag’s international brewery festival, Hagstravaganza, takes place on 28 July at their brewery in Ballymote, Co Sligo. For details and tickets, visit the website. Email “'We've seen at least four craft breweries close down this year': Fighting back against Big Beer”. Feedback on “'We've seen at least four craft breweries close down this year': Fighting back against Big Beer”.